Bulk SMS Malaysia API is a great choice when integrating message delivery function to your website or application. iSMS Malaysia API is flexible, simple to use and easy to understand for developers to work on connecting with iSMS Gateway. This Bulk SMS Scheduler API will help you to set the SMS schedule without logging into iSMS admin console. All available features and configurations will be displayed at the iSMS Developer API page. Integrate our SMS API into your PHP application and enjoy our SMS services. Please click below to find out about other task scheduler samples. 1. Firstly, register a username and password from iSMS Register Page. Bulk SMS Scheduler API only requires a few information from you such as username, password and your mobile number. It is free. You may click HERE to learn how to reload your iSMS account. You will find that the Task Scheduler is empty as you have not created any task scheduler. Create a PHP file with the file name below. You may use any file name. It is advisable to create a without any empty spacing in the name. An ID will be attached to every task scheduler you create. 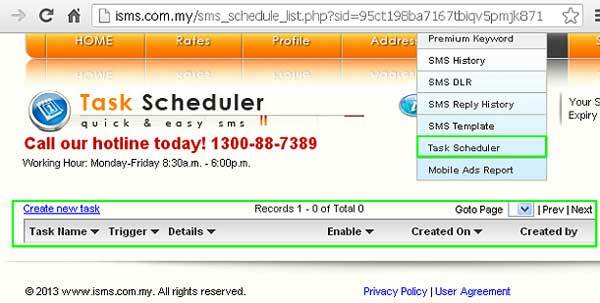 If you need to do update or delete task scheduler using our Bulk SMS Malaysia API, you can use the ID in your application to do so in future. The task scheduler is created.